In the summer of 1797, Samuel Coleridge, his wife Sara, and their infant son Hartley settled into a rustic cottage in the village of Nether Stowey, a few miles south of the Bristol Channel. The cottage's garden adjoined a bower of lime trees (better known as lindens) maintained by their friend and next-door neighbor, Thomas Poole. Their newest literary friends, William Wordsworth and his sister Dorothy, had rented a house the next town over; and Charles Lamb, Coleridge's intimate since their school days at Christ's Hospital, spent frequent nights in the cottage's spare bedroom. 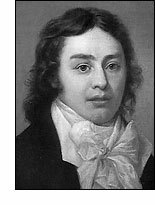 During the next eight months of almost constant contact within this tight-knit circle -- daily excursions into the Quantock Hills and nightly sessions of poetry recitation and critique -- Coleridge brought to fruition an experiment in style he'd begun in the mid-1790s: the conversation poem. See the complete text of "This Lime-tree Bower My Prison." Gail Mazur, Robert Pinsky, Lloyd Schwartz, and Mark Strand read Elizabeth Bishop's haunting late poem. With an introduction by Lloyd Schwartz. David Barber, Carolyn Kizer, and Christopher Ricks read the underappreciated English Romantic poet John Clare's greatest poem, "I Am." With an introduction by David Barber. Mark Doty, Linda Gregerson, W. S. Merwin, and Lloyd Schwartz read Shakespeare's famous sonnet ("Let me not to the marriage of true minds..."). With an introduction by Linda Gregerson. Lucie Brock-Broido, Steven Cramer, and Mary Jo Salter read Dickinson's poem of hopeless love. With an introduction by Steven Cramer. Peter Davison, Donald Hall, and Maxine Kumin give voice to this poem by Robert Frost. With an introduction by Peter Davison. Donald Hall, Philip Levine, and Rosanna Warren give voice to this poem by Thomas Hardy. With an introduction by Philip Levine. Robert Pinsky, Gail Mazur, and David Ferry read aloud this great poem of unrequited love. With an introduction by Robert Pinsky. Frank Bidart, Marie Howe, and Galway Kinnell read Whitman's stunning poem of self-doubt. With an introduction by Steven Cramer. Richard Wilbur, Philip Levine, and Peter Davison give voice to one of the century's greatest poems. The first installment in a series of classic-poetry readings by contemporary poets, with an introduction by David Barber. Join a conversation on poets and poetry in the Books & Literature conference of Post & Riposte. View the full text and images of Lyrical Ballads (1798), by William Wordsworth and Samuel Taylor Coleridge. The Lyrical Ballads Bicentenary Project was created in 1998 by Ronald Tetreault of Dalhousie University and Bruce Graver of Providence College to celebrate the two hundredth anniversary of the original publication of Lyrical Ballads. As far as I can tell, Coleridge's only use of the term in print occurs in an epigraph to one of his four contributions to Lyrical Ballads (1798), the great collaboration with Wordsworth that inaugurated the poetry of English Romanticism. He calls "The Nightingale" a "conversational poem." Abbreviated in subsequent editions of his work to a "conversation poem," the epigraph has provided critics with a generic tag for "The Eolian Harp," "Reflections on Having Left a Place of Retirement," "Fears in Solitude," "To William Wordsworth," and -- in almost everyone's estimation the two finest examples -- "Frost at Midnight" and "This Lime-tree Bower My Prison." Less celebrated than his gothic narratives "The Rime of the Ancient Mariner," "Christabel," and "Kubla Kahn," the conversation poems -- invariably cast in the autobiographical voice of Coleridge himself -- have influenced modern poetry more strongly, I believe, than the combined forces of those supernatural anthology pieces. What do conversation poems sound like? In his Biographia Literaria, the exhuastive history of his life and mind written roughly two decades later, Coleridge described the manner he was after: "There are not a few poems ... replete with every excellence of thought, image, and passion -- yet so worded, that the reader sees no reason either in the selection or the order of the words, why he might not have said the very same in an appropriate conversation." He also knew the antecedents to the mode. He admired the "divine chit-chat" of William Cowper's "The Task," as well as its ease with natural description and direct emotion. The gravity of the conversation poems comes in large part from Milton. Yet Coleridge's choices of subject and rhetoric convey an intimacy of expression peculiar to him -- adapted, appropriately enough, from a series of verse letters composed to friends. More important to a claim for its lasting effect, What does a conversation poem do? How does it shape imaginative thought? Typically, a conversation poem begins in a precisely visualized, usually domestic location -- the fire-lit nursery in "Frost at Midnight," where Coleridge watches over Hartley as he sleeps; or just outside the "pretty Cot" in "The Eolian Harp," where the Coleridges spent the first idyllic weeks of their ultimately dreadful marriage. Fortified by the sense impressions of its locale, the conversation poem then sets off on a journey -- into memory, introspection, metaphysical projection, and finally toward a vision of divinity -- before circling back, the poet profoundly changed by that epiphany, to the spot from which it embarked. In the June of 1797 some long-expected friends paid a visit to the author's cottage; and on the morning of their arrival, he met with an accident, which disabled him from walking during the whole of their stay. One evening, when they had left him for a few hours, he composed the following lines in the garden-bower. The exactitude of the details here is glorious, but there's more to admire. Maintaining a delicate balance between conjecture and certainty -- "perchance" versus "of which I told" -- Coleridge adjusts diction, phrasing, and rhythm to bring those details and their emotional shadings into clearer focus. He doubles sensory adjectives and nouns, qualifies assertions ("ne'er tremble in the gale, yet tremble still"), and orchestrates mimetic syntax and enjambment, most dramatically when the ash tree "its slim trunk ... from rock to rock/ Flings arching like a bridge." To appreciate how scrupulously arranged are the elements in that line and a half, normalize the word order and notice what's lost. In the first two lines, parallel construction, a strong pause at the line ending, and two midline pauses create a see-saw rhythmic balance that reinforces nature's promise to show its benign face wherever one turns. After the second pause, the alert ear reasonably expects the pattern of paired-off phrases to continue. Instead, a new rhythmic principle takes over as Coleridge syncopates line with syntax, and energizes the active parts of speech by breaking "employ" against "each faculty" and "heart" against "awake." The total effect of these four lines is one of beautiful fluidity developing out of symmetry. That closing line could stand by itself as a manifesto for the conversational aesthetic: harmony derives from the real in conjunction with the ideal, and colloquial speech has its music too. But it's the passage as a whole, a sinuous nine-line sentence, which enacts the poem's last and loveliest homecoming. The crow's flight "homewards" retraces and refigures the link between Coleridge and Lamb, as the poet's mind projects outward again to imagine one more instance of two visions coinciding. "Visions coinciding" is Elizabeth Bishop's phrase, from Geography III's "Poem." Anyone wishing to trace Coleridge's legacy should turn now to that modern conversation poem. The circling movement from home (a painting of Bishop's Nova Scotia hometown) through a retrospective and imaginative journey, then back home; the exclamation as memory and imagination fuse (Coleridge's "Yes!" and Bishop's "Heavens! "); and the human-to-human bond ("I never knew him," Bishop says of the Sunday painter whose work she examines with deepening affection, but "we both knew this place") -- these parallels between the two poems astonished me when I first noticed them. Even more startling, when read together they interact in an elegant counterbalance: what Coleridge remembers becomes what he imagines; what Bishop imagines becomes what she remembers. Many other contemporary American poems -- Richard Wilbur's "The Writer," Robert Hass's "Letter," Ellen Bryant Voigt's "Blue Ridge," Jon Anderson's "In Autumn" -- adopt a version of the journey-and-homecoming pattern Coleridge perfected in the late eighteenth century. Were these poets aware of his influence? I can't say, although it's a safe bet that each has read Coleridge with care. Of course, the structure these poems share may transcend a single through-line of influence. Is the shape of the conversation poem simply one of the forms an introspective mind takes when engaged in introspection? See the complete text of "This Lime-tree Bower My Prison," read by Steven Cramer, Stanley Plumly, and Tom Sleigh. Steven Cramer is the author of The Eye That Desires to Look Upward (1987), and The World Book (1992), and Dialogue for the Left and Right Hand (1997). He is currently teaching at MIT and Boston University. Stanley Plumly is a Distinguished University Professor at the University of Maryland at College Park. He is the author, most recently, of Now That My Father Lies Down Beside Me: New and Selected Poems (2000). Tom Sleigh teaches at Dartmouth College. His most recent book of poems is The Dreamhouse (1999). Copyright © 2000 by The Atlantic Monthly Group. All rights reserved.